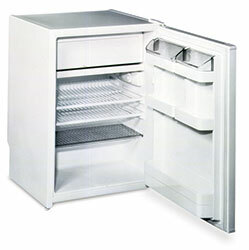 These refrigerator-freezers have gasketed magnetic doors with white steel panels and rustproof shelving. 5.6-ft3 model has three shelves, with room for eight ice trays or comparable room for biological samples or chemicals requiring sub-freezing temperatures. Operates on 120 VAC. 13-month warranty.